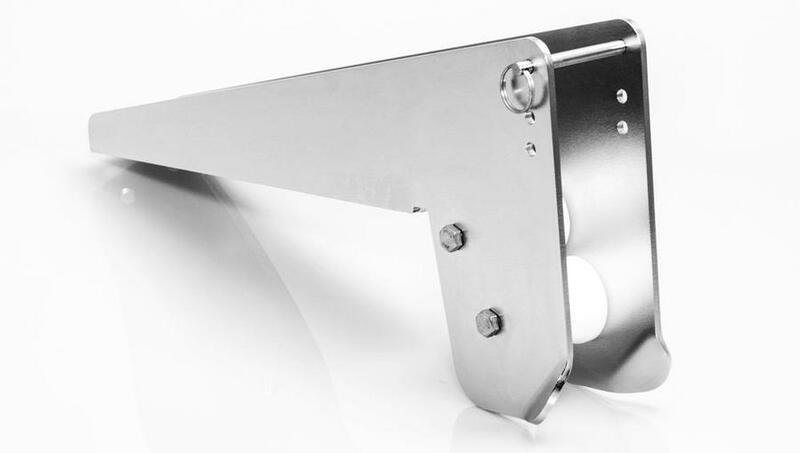 This heavy-duty bow roller has a quick release pin that is adjustable to help secure the anchor while stowed. The bow roller hangs low on the bow to keep the anchor out of sight lines. It is 18 1/2" (49.99 cm) in length and is suited for our QuickSet anchor as well as Fluke, Danforth, Lightweight, Slip-Ring, Plow and Bruce/Claw style anchors between 22 to 60 Lb (9.97 to 27.21 Kg). Features: Saltwater tested to 500 hours with no signs of corrosion or rust. Manufactured in Canada. Made of 100% Marine Grade U.S.A. Stainless Steel for maximum tensile strength and long lasting corrosion protection. Uses Acetal Roller Wheels; a strong superior dense polymer material that is UV resistant. Bow Roller wheels are precision cut on our CNC lathe and wont yellow, fade or crack. Uses W2-24 Kingston Anchors Roller Wheel. Uses 3" Quick Release Pin QRP-3. 18-1/2" Length x 2-7/8" Width x 8-3/4" Deep.